How have Natural Moves helped others? How Do I Use Natural Moves? Most people have at least one bowel movement a day. However, bowel habits vary from person to person and more or less frequent bowel movements are not necessarily a sign of constipation. Most doctors will agree, however, that anyone who has a bowel movement less than three times a week and passes hard stools can be said to be constipated. Constipation happens to everyone occasionally, but some people suffer from chronic constipation which makes their lives a misery and each bowel movement a huge relief! Occasional constipation is usually caused by diet, lack of exercise, stress or drinking insufficient liquids. Chronic constipation can be caused by a variety of factors, including digestive disorders like IBS, lack of fiber and fluid in the diet, depression, lack of exercise and some medical conditions like diabetes, colon cancer and hypothyroidism. Constipation may also be a side effect of some prescription drugs for depression, high blood pressure and pain relief. In addition, many people have lost natural bowel movements due to the overuse and abuse of OTC and prescription laxatives. Herbalists and naturopaths from cultures all over the world have used herbs for centuries to promote regular bowel movements, purify the system and treat constipation. However, even some herbs are not suitable for regular use due to their excessively strong purgative effects. Fortunately Feelgood Health has the answer! Using herbs which are strong enough to treat even stubborn constipation, yet gentle enough not to cause unpleasant diarrhea and cramping, Feelgood Health Natural Moves Tablets can be used for both chronic and occasional constipation, depending on the dosage used. The herbs used in Natural Moves Tablets promote healthy digestion and also act as an effective liver tonic, therefore avoiding the risk of dependency and side effects associated with some other laxative products. Natural Moves combines Aloe Vera and Taraxacum officinale (Dandelion), both known for their laxative properties and beneficial effect on digestive health. Passiflora is added to relax the muscles of the bowel wall and to relieve stress and axxiety which is often associated with digestive complaints like constipation and IBS. "It may seem silly to some, but I stress about constipation every day. Never a day goes by when I do not struggle to have a normal bowel movement! Natural Moves has helped to make me more regular and so I feel much more relaxed. I have tried many products, ranging from herbal to drugs, but this one works by far the best." "If you try any laxative product, try this one! I don't have a problem every day, but because I don't get much exercise and my diet is not always the very best, I do sometimes have a problem. Natural Moves really helps!" "I have a history of eating disorders and made much use of OTC laxatives in the past. This has messed up my bowels big time! No matter how healthy I eat, I still have problems. This product has been a lifesaver for me!" "I have IBS and can sometimes become very constipated. Many products I have tried have caused the opposite problem as well as terrible cramps due to my extremely sensitive digestive system. Natural Moves seems to live up to its claims - it works, but does not cause me to have diarrhea or affect my sensitive stomach." Aloe Ferox A succulent and well known medicinal herb native to South Africa, Aloe Ferox has many different uses and writings from as early as 1500BC in Ancient Egypt document its medicinal uses. Amongst other benefits, Aloe Ferox is known for its beneficial effect on digestive functioning and acts as a natural laxative and remedy for constipation. It is also widely recommended for digestive complaints and for inflammatory digestive disorders like IBS and inflammatory bowel disease. Taraxacum officinale (Dandelion) Dandelion contains bitter principles which have a beneficial effect on the liver and digestive system. It aids digestion by stimulating the release of bile from the liver and also acts as a mild laxative. Dandelion is also a rich source of vitamins and minerals, including Vitamin A, D, C, various B Vitamins, iron, lecithin, silicon, potassium, magnesium, zinc and manganese. It enhances liver and gall bladder functioning and may decrease high blood pressure due to its diuretic properties. Passiflora incarnata One of nature's safest and most effective tranquilizers, Passiflora also helps to relax and to relieve muscle tension. High tension levels, anxiety and stress are often implicated in people suffering from chronic constipation and other digestive complaints. Passiflora is included in Natural Moves to enhance the effects of Aloe Ferox and Taraxacum officinale. 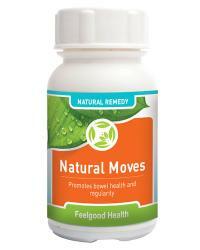 Each Natural Moves Tablet includes 575 g of high quality fresh powdered whole spectrum herbs in therapeutic dosage. Dosage depends on individual needs as well as whether your constipation is chronic or only an occasional problem. For Occasional Constipation: Two tablets when needed taken with a glass of water or milk at night will easily help to produce a normal bowel movement upon awakening. Make sure that you allow yourself time the next morning to enjoy a natural bowel movement before beginning your day! For Chronic and Stubborn Constipation: Take 1/2 to one tablet every morning and two tablets at night. For added benefit, use together with our Triple Complex Digestion Tonic. Children over the age of 6 may occasionally use 1/2 - 1 tablet of Natural Moves at night. Tablets may be crushed and mixed with a little food for those who prefer not to swallow them whole. Caution: Safety during pregnancy and breastfeeding has not been established. Do not exceed the recommended dose! Please consult your doctor if there are sudden changes to your normal bowel habits, if you experience pain, fever or blood in your stools or if symptoms persist for more than two weeks, despite treatment. As with many effective herbal treatments, Natural Moves begin to work on the body systems almost immediately and results should be seen within 12 hours or sooner. One bottle contains 60 tablets and lasts approximately a month or more, depending on use.